Ahhh... a beautiful bush wedding in Africa, just the thought is enough to make most brides misty eyed. Getting married safari style is really about the destination - here are some fabulous romantic lodges in KwaZulu-Natal to make your wedding dreams come true. A wedding should be special, whether it is an intimate occasion for a small party or a grand affair with numerous guests, the attention to detail should be the same. On safari, friendly and professional lodge staff will see to it that everything is arranged for you in style and there are many unique ways to enhance the event.You can choose to have the ceremony deep in the bush or at a lodge location with great views. A traditional Zulu choir or dance group and drumming can form part of the welcome for the arrival of the bride and groom. Enjoy spectacular photographic opportunities with wildlife in the background or you can even pose with a Cheetah.These KwaZulu-Natal lodges can put together the perfect wedding package which could include spa treatments for the bride and groom, game drives for the wedding party and special preparations for the wedding night, such as candles, champagne and rose petals in the suite. At Emdoneni you can enjoy unique interaction with Cheetah, Caracal, Serval and African Wild Cats in a leafy and tranquil setting. For the wedding night there is a delightful and private cottage which just oozes romance. You can exchange vows in a beautiful setting with a gazebo draped in white at the river bed or at a special spot in the bushveld. Enjoy private dining under a starry sky and a wonderful encounter with resident Elephants, Rambo and Rachael. Enjoy a 5-star wedding function and service to match in a range of great settings. The cathedral thatch lodge affords wonderful views of the falls and river. Once you've tied the knot in style you can retreat to the romantic Safari Suite with its plunge pool and intimate deck. Nambiti offers a range of intimate locations for your ceremony and reception and the services of a dedicated wedding co-ordinator. Enjoy panoramic views from the lodge, superb decor and a stunning hillside suite for the wedding night. 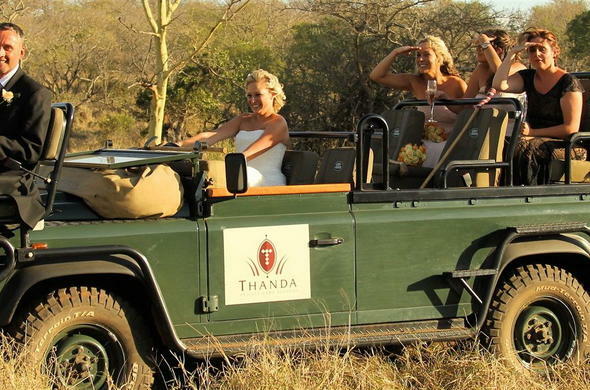 Thanda means "love" in Zulu, so if you want the ultimate in romance this is the place. Attention to detail and anticipation of your needs and wants is what Thanda offers you in a selection of beautiful venues. Thanda is a member of the Leading Hotels of the World.